Aditya Chopra and Shahrukh Khan, the director and actor responsible for the Bollywood classic Dilwale Dulhania Le Jayenge, succeed again with Rab Ne Bana Di Jodi. 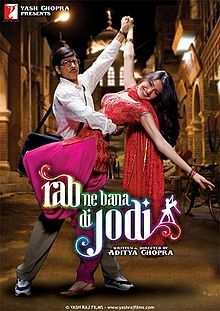 In RNBDJ, Khan plays Suri, a mild mannered guy who fulfills his mentor’s dying wish by marrying the mentor’s daughter, Taani (Anushka Sharma). Though Suri’s older and less flashy than she is, Taani accepts her new role as his wife, with the caveat that she’ll never be able to love him because of her broken heart. Timid Suri, unable to show his wife how much he loves her, secretly invents a flashy alter ego named Raj in order to bring some joy into Taani’s life. Chopra thoroughly explains the emotions motivating Suri and Taani, and Khan and Sharma perfectly portray the characters. The relationship between the pair is believable, despite the age difference between the duo (Khan is 43 and Sharma is 19). Sharma’s nuanced performance makes it hard to believe that this is her first film. Cases of mistaken identity are often hard to pull off onscreen, but Khan looks and acts so differently as Suri and Raj that it seems totally reasonable that Taani wouldn’t know that the two men are the same person. RNBDJ trips up late in the film during a sequence in which Suri battles a sumo wrestler. The scene is so long and out of place that it completely brought me out of the movie. While the scene intends to show that Suri would do anything to make Taani happy, I would rather have seen more examples of that interspersed throughout the film. Taani continually performs small acts of kindness for Suri, while Suri’s affection seems to stop after providing Taani with a place to live, only to rekindle during the over-the-top sumo showdown. Suri doesn’t seem like the kind of guy who’d try to impress his wife with a big spectacle. Apart from the one misstep, the movie is flawless. Chopra’s attention to detail is especially obvious during RNBDJ‘s big dance number, “Phir Milenge Chalte Chalte.” I’m almost always distracted by the background dancers in item numbers: one dancer is out of sync with the others, another is wearing an unflattering outfit, etc. No such worries, here. When I noticed the background dancers in RNBDJ, they looked spectacular. But most of the time, my attention was on the lead couple, as it should be. This entry was posted in Reviews and tagged 2008, 3.5 Stars, Aditya Chopra, Anushka Sharma, Bollywood, Dilwale Dulhania Le Jayenge, Phir Milenge Chalte Chalte, Rab Ne Bana Di Jodi, Shahrukh Khan on December 16, 2008 by Kathy.